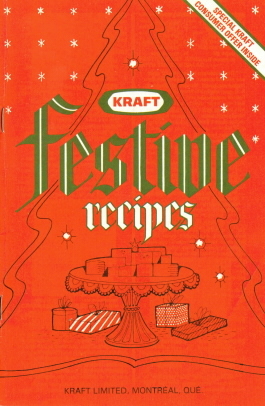 This is a recipe booklet from KRAFT that’s from 1979 (judging by the expiry date for the coupons in the middle of the booklet). There are 11 pages of recipes so I’ll just include a few below. Cream margarine and sugar; blend in eggs. Sift together flour, baking powder, salt and baking soda; add alternately with water and orange juice, mixing well after each addition. Fold in cranberries, nuts and orange rind; pour into greased 9 x 5-inch loaf pan. Bake at 350°F (180°C), 1 hour and 10 minutes. Combine softened cream cheese, sugar and vanilla, mixing until well blended. Prepare baking mix according to package directions for biscuit dough. Roll to 12 x 8-inch rectangle on lightly floured surface. Spread with cream cheese mixture; sprinkle with nuts and raisins. Roll up, starting on long side; seal long edge. Place on greased cookie sheet; join ends to form ring. With scissors, cut three quarters of the way through ring at 1-inch intervals; turn each section on its side. Bake at 425°F (200°C), 15 minutes. Glaze with honey; continue baking 5 to 7 minutes or until golden brown. Glaze with additional honey, if desired. Combine all ingredients; mix lightly until well blended. Stuff chicken or turkey. NOTE: Stuffing can be baked in a greased covered shallow pan at 350°F (180°C), 30 minutes. (Allow approximately 3/4 cup stuffing per 1 lb of bird). Cream margarine and sugar; blend in eggs. Add bananas; mix well. Combine flour, baking powder, salt and soda; add to creamed mixture alternately with buttermilk. Stir in nuts. Pour into greased and floured 13 x 9-inch baking pan. Bake at 350°F (180°C), 45 to 50 minutes. Cool. Frost with Caramel Frosting. Combine margarine, milk and brown sugar in saucepan; bring to a boil, stirring constantly. Cool to 10 minutes. Gradually add icing sugar, beating until well blended. Combine dressing, potatoes, celery, onion and bacon. Cook over low heat until thoroughly heated, stirring occasionally. Remove from heat; stir in cheese. Serve hot. Anyone have a recipe for “Pudding Cake” that came off a box of Parkay margarine..back in the 50s? Was the “Pudding Cake” like a regular cake in texture or was it a dessert that separated into cake on top and pudding under the cake when baked? I have a recipe for Fudge Batter Pudding that is the second description. I am looking for a vegetable dip recipe that used to be on the old english cheese jar. It called for cream cheese and maybe sour cream as well. Thanks! years ago i ordered the paper kraft recipe books, there was a recipe for bananna tea ring, amazing. I’m looking for a Kraft Mac & Cheese recipe that added olives and several other things. It was really good.